Rick Leppo, a general dentist in Columbia, Illinois, renowned for his commitment to quality dental care, integrity and leadership has been featured in the November 2017 issue of Dentistry Today magazine. Dr. Leppo’s article discusses the importance of a well-established framework in providing patients with an exceptional dental experience. Being featured in Dentistry Today magazine is an honor, and has allowed me to highlight my passion for providing exceptional patient care, which remains the true measure of success at Columbia Dental Center, says Dr. Rick Leppo. The November issue of Dentistry Today magazine features an article from Dr. Rick Leppo, a leading general dentist in Columbia, Illinois, just outside of St. Louis, MO. Dr. Leppo provides expert insight into building a top-quality patient experience. His understanding has proven that patients are more likely to trust all aspects of their care when they have a positive dental experience. This includes interactions with staff, appointments and insurance handling, financing, amenities and comfort. Dr. Leppo optimizes patients’ experiences at his Columbia-Waterloo practice by taking the time to define and prioritize systems along with his team. With patient comfort, care and feelings as top priority, every element focuses on making the patient’s life easier. Therefore, when specialized treatments are needed, such as endodontics, Dr. Leppo offers the convenience of in-house services to make the best use of a patient’s time. When matters arise with insurance, treatment scheduling or oral health updates, special efforts are made to ensure that patients get the information that they need when they need it. With honesty and professionalism at the forefront of every interaction, Dr. Leppo leads his practice with a simple motto—to treat each patient like family. “Being featured in Dentistry Today magazine is an honor, and has allowed me to highlight my passion for providing exceptional patient care, which remains the true measure of success at Columbia Dental Center,” says Dr. Rick Leppo. A native of Northwestern Illinois, Dr. Leppo completed his undergraduate studies at Southern Illinois University Edwardsville, and obtained his Doctor of Medical Dentistry from SIU School of Dental Medicine. Furthermore, Dr. Leppo acquired advanced training in oral surgery, sedation dentistry, implant dentistry, orthodontics and endodontics. Having achieved Fellowship status with the Academy of General Dentistry (FAGD) and Mastership with the College of Sedation in Dentistry (MaCSD), he remains an accomplished leader in the dental community, and believes that the cornerstone to dental success is found in providing a great patient experience. Dr. Leppo’s unique skillset, including advanced training in implantology and bone grafting techniques, as well as dual certification in CPR and ACLS (Advanced Cardio Life Support) shows his continued commitment to support the needs of patients in Columbia and Waterloo. Even so, when Dr. Leppo is not serving patients at Columbia Dental Center, he is actively involved in his local community as a member of the Columbia Chamber of Commerce, Columbia Rotary Club and the non-profit organizational program, “Give Kids A Smile,” which provides underserved children with free comprehensive dental care. 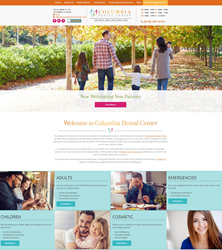 For more information about Dr. Rick Leppo, and the services offered at Columbia Dental Center, visit http://www.columbiadentalcenter.com or call the practice directly at (618) 281-6161.